If you could go wherever you want on vacation, where would you go? Consider taking a tip from some of our favorite celebs and visiting their top destinations. From birthdays to holidays and honeymoons, these 4 spots top celebrity vacation lists. Or, if you’re like most of us and fancy resorts aren’t in your price range, you can at least use the list to start a betting pool – Rob Kardashian and Blac Chyna just got engaged, surely they’ll head somewhere special to celebrate. Let’s be honest – who hasn’t dreamed of lying on the beach in Saint-Tropez? This beautiful French village, part of the French Riviera, features crystal blue waters and a gorgeous landscape that attracts everyone from Keanu Reeves to Beyonce and the Beckhams. Although technically part of the mainland, Saint Tropez will make you feel like you’ve gone to an island without quite so much isolation. You could even hop up to Nice if you wanted to – but why would you want to when you could stay lounging on the beach? While Colorado is home to some of the best skiing in the U.S., if you’re looking for something a little bit different, join the likes of Heidi Klum and Hugh Jackman in Whistler, British Columbia. Whistler was home to the 2010 Winter Olympics so you can be sure the skiing is superb. You’ll need a little more gear for this trip than for a beach vacation though, so don’t pack at the last minute – you’ll want time to weatherproof your gear, polish your skiis, and dig out your goggles. Luckily you’ve got some time until ski season. George Clooney takes his Italian vacationing seriously – he owns a beautiful villa on Lake Como, in Laglio, a spot that allows him to take regular advantage of boating opportunities and soak in the rich Italian culture. Laglio is a small town – a hamlet, really, so it may not have as much to offer the average vacationer, but it certainly increases your odds of the coveted Clooney sighting! Of course, in their downtime, celebs don’t all head to international locales – some stay close to home and enjoy some time off. Halle Berry is just one of many celebs happy to chill on the beach in Malibu. 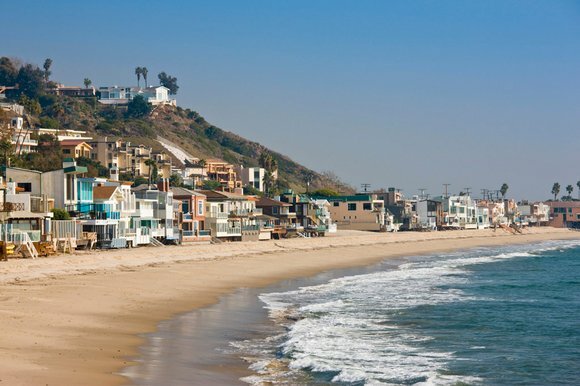 And of course, Malibu has more to offer than beaches, including famous eateries like Nobu. You’ll want to book ahead to get a taste of famed chef Nobu Matsuhisa’s cuisine. While these spots are favored by many celebrities, there’s no knowing who you’ll bump into on vacation, even if more traditional vacation spots – celebs like to take their kids to Disney, too. Still, it’s fun to imagine what it would be like to hop on a private plane to one of these destinations and spend the trip playing the part of the fabulous and wealthy. We all can dream.